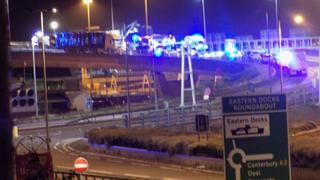 A lorry driver has been arrested on suspicion of causing death by dangerous driving after two people died in a crash. The 51-year-old, from Romania, was held after a collision between a lorry and a Nissan Qashqai in Dover, just before midnight on Sunday. The driver of the car, a man in his 20s from Canterbury, and a male passenger died at the scene, in Jubilee Way. A man, 36, also arrested at the scene has been released without charge.